Brunch is basically the cheekiest meal of the day. You’ve secretly already had brekky, it’s not quite lunch, yet you’re already famished and heading out for a friendly catch up is on the cards. But amidst all of that smashed avo, acai and bacon rashers something’s missing…booze! Somewhere along the way, the general population decided there needed to be a socially acceptable solution to sinking some cold ones in the morning. Then the whole world got on board with brunch—voila, the solution! And there’s been tipsy folk roaming the streets at 11am ever since. 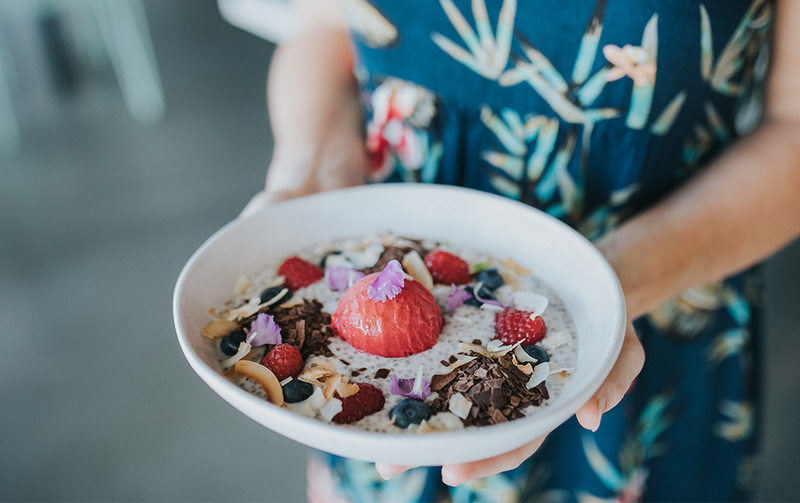 No more trying to sneak rum balls in for breakfast, passing off nana’s port-laced fruit cake for raisin toast or spiking your own tea with liquor, here are all of the best boozy brunch spots on the Gold Coast. Who would have thought this brekky hotspot transformed into a watering hole at 10am?! Your wildest dreams have come true at Elk Espresso with boozy treats pouring 7 days a week. Bring along your doggo to bask in sunlight all the way through to lunch, Monday to Friday when any main is paired with a glass of wine for just 25 bucks. Oh, if we must. Mornings call for cocktails! And your friendly Little Mermaid bar legends are ready to give you more bang for your brunch. Refreshing, creamy and downright naughty cocktails start shaking from 10am right through to 3pm, 7 days a week. Want to start off slow with a disguised orange juice in attempt to fool passersby going for their morning dog walk? One and a half hours of pure bliss is on offer with endless Mimosas geeing you up. Then have a crack at the Diamond Daiquiri in all of its mango, peach and coconut glory. If you’re still waking up, the tequila, passionfruit and peach Mexican Cartel will get the blood pumping stat. Rubbing shoulders with the rich and famous doesn’t have to involve spending your life savings on a night at the Palazzo Versace. Get glammed up and make yourself comfy in one of three fancy dining experiences. Make brekky a late one at multi-award winning Vanitas and bring the spectacles. Not only because you’ll be needing a hand seeing straight, but also to help you get through their 23-page wine list. Know what’s better than one of Bam Bam Bakehouse’s famous Nutella Cruffins? Not much to be fair but scoffing one down with a cold one in your hand is about as close as it gets. Bam Bam’s reputation as one of the best boozy brunch spots on the Gold Coast is rightfully earned. We just can’t fault their menu, flaky pastries and OTT new creations rolling out of their baking station on the reg. Drop by from 10am for your tipsy sesh 7 days a week. We’re pretty big fans of options. And after a few bevvies you’ll have more than enough choices for a cheeky round of musical chairs at The Yard. Street side, window pozzies, moody hideaways and a sprawling alfresco heaven lined with vines and rustic day lounges await. Yep, we’ve just found your fave all day booze up. With interesting cocktails like the passionfruit and strawberry filled Love Potion, New Blossom topped with Cachaca, orange and thyme, plus so many more, you’ll be singing ‘My milkshakes’ in no time. The bar opens from 10am, the brekky and lunch menu runs all day long with a selction of wholesome salads and tapas tasties…or just go straight to the cheese board. Digging into some healthy eats doesn’t mean you’ll be missing out on bubbles anytime soon. We reckon that Nobby’s own BSKT is one of the best boozy brunch spots on the Gold Coast and they start pouring from 10am. Swap that cuppa for an organic espresso martini, your kombucha for a vodka with fresh orange juice, and the ginger beer for a spiced rum and organic cola. The best part? It’s totally guilt-free because instead of gorging on kebabs and three cheese pizzas, you’ll overindulge in healthy benny’s, miso salmon and vegan pad Thai. Make ours a double! Ease into Sundays at QT Bazaar. From $59 per person, you’ll have one of the best boozy brunches on the Coast with all the trimmings. First, you’re greeted by a complimentary Chandon rosé on arrival and then it’s time to peruse a whole range of brunch choices. Think: roving canapes, crepes made to order, fondue, gourmet brekkie bowls and a selection of fried chicken and waffles for the savoury lovers. Treat yourself to a Belvedere espresso martini, morning Bloody Mary or just take advantage of bottomless Mimosas. Hosted from 11:30am-3pm every Sunday, you’ll be right as rain in no time. If you find yourself north with a thirst in dire need of being quenched, Daark Espresso is the place to check out. The perfect side dish to your B&E burger, cinnamon and raisin bagel or cherry tomato bruschetta is, of course, a glass of sav, bubbling Moscato or icy cold beer. With a local crowd who can’t get enough of the place, it’s safe to say you’ll have company when the drinks begin to flow from 10am. Looking for somewhere to kick on? Check out our round up of the best rooftop bars.